When John Mason discovers that his fiancée's father has embezzled thousands of pounds from their mutual business, he's furious. When his betrothed, Miss Mary Chartley, flees, taking the money and all the evidence with her, he's outraged. He plans to bring the woman he once loved to account--and he’ll shed no tears when he does. But when he finds Mary, she's not living a life of luxury. Instead, she's serving as a companion in exchange for a pittance. The more he attempts to untangle the truth, the more he remembers why he first loved Mary...and how much he wishes he could do so again. 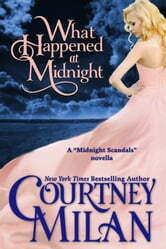 What Happened at Midnight was previously published in the anthology Midnight Scandals. It is a novella of about 35,000 words.